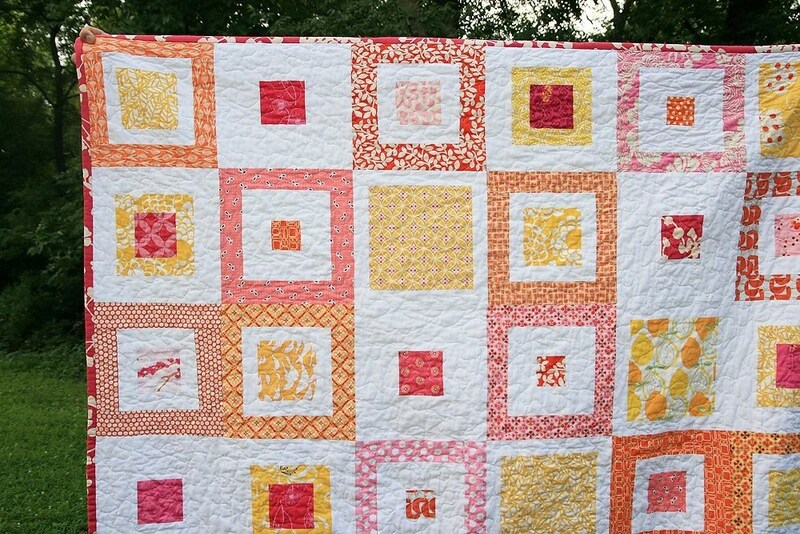 My sister-in-law is having her first baby in May and I want to make her a quilt. 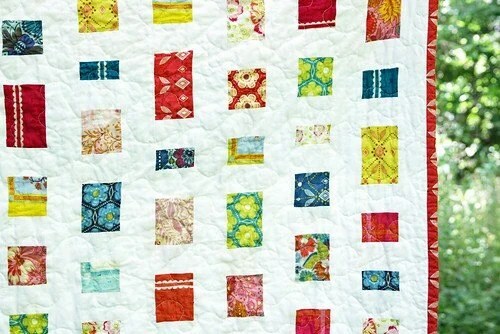 Some reason I am envisioning my niece telling/showing her kids someday about this quilt her auntie made her. So her colors are hot pink and lime. 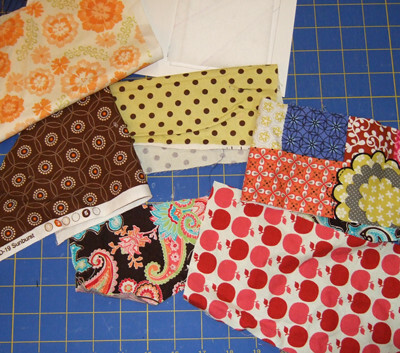 Since the colors are so bold I am thinking of doing a quilt with alot of white with splashes of these colors in it. 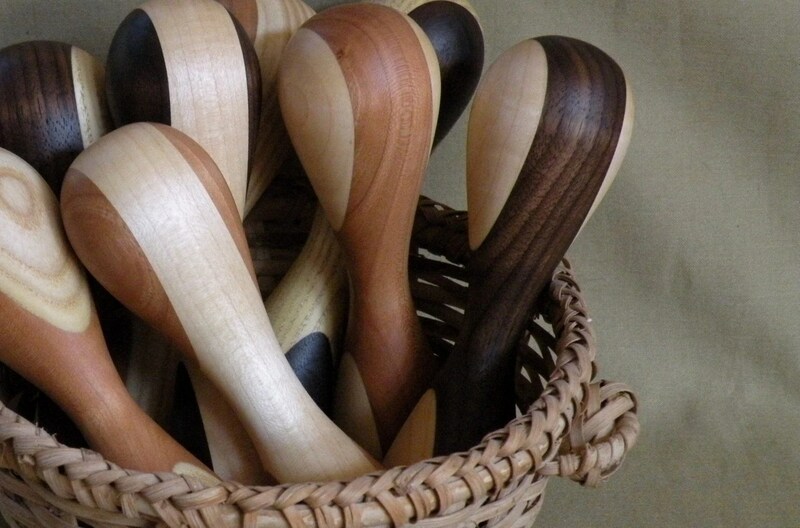 Cant wait to get started.. i have until April for the shower…. 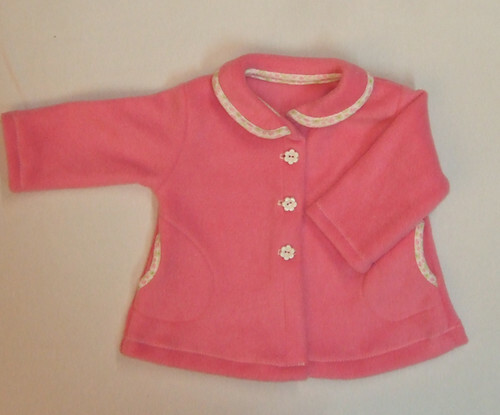 SO FUN sewing for a baby again! Cute Knit Headband Ebook is DONE! I have been working like a mad woman on diapers.. but found a brief moment to do up this eBook pattern for this headband with a bow! 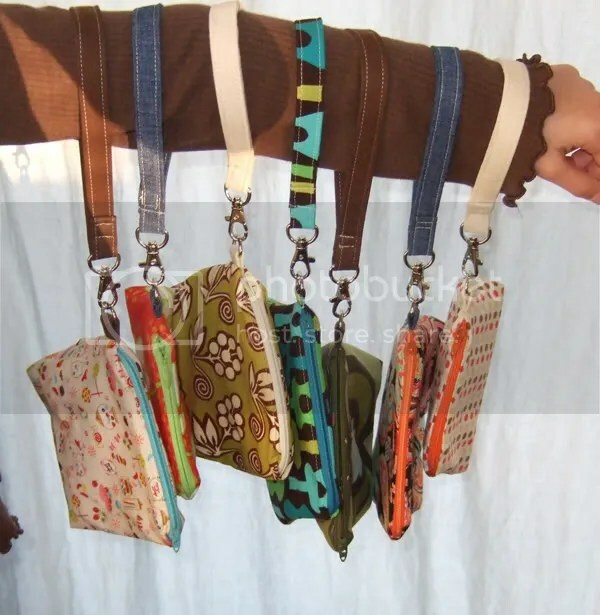 Great use of your knit scraps! Isnt she cute?? Lol That little girl is such a joy! She is just the bestest baby. But then again ALL my kids were great babies. It wasnt until they reached 7 or 8 that they got difficult, lol. I cant complain, I have really wonderful children! 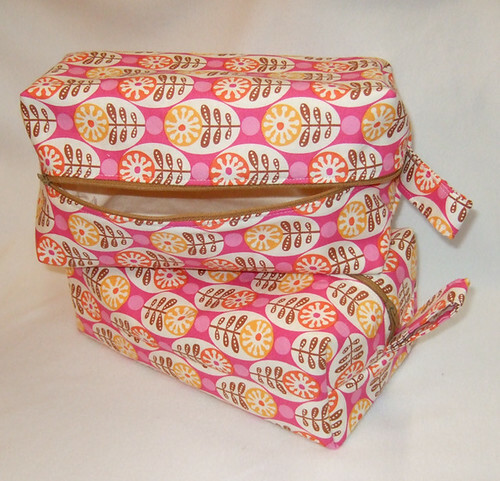 I have found a great use for some scraps of fusible fleece, fleece and wovens!! SO gather some scraps and lets get started! First print these templates if you choose to use mine. 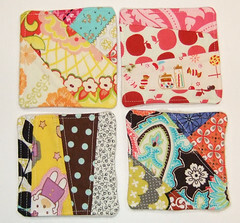 Or make a 4″ square and make a pattern on it!!! 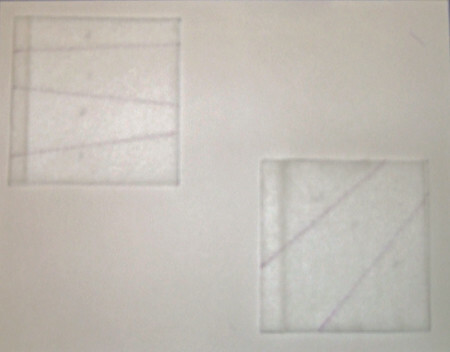 Also, I will try to explain a very basic and brief way to paper piece. 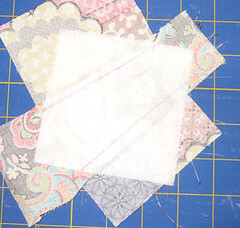 If I am confusing you I suggest viewing this free tutorial on paper piecing. 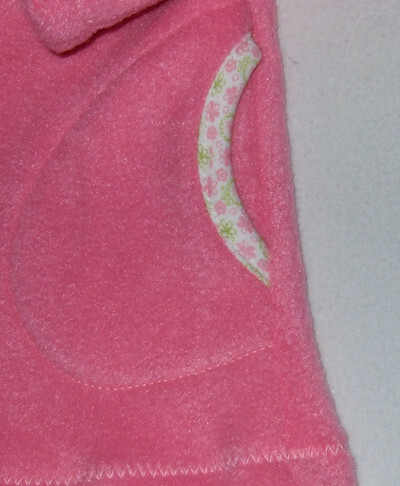 Although we arent using PAPER, we are using fusible fleece, the method is pretty much the same concept! 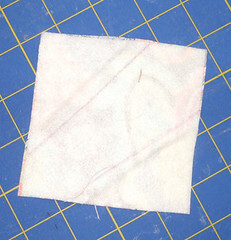 Take your fusible Fleece with the fusible side to the paper (down), trace the square and lines with a marking pen. Then gather some scraps! 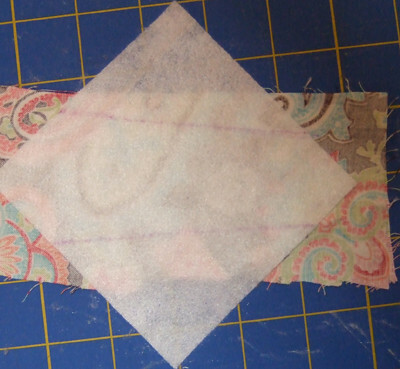 Take your first scrap piece place Right side down and place the fusible fleece template on it. Make sure it will cover the full area you are wanting it too. 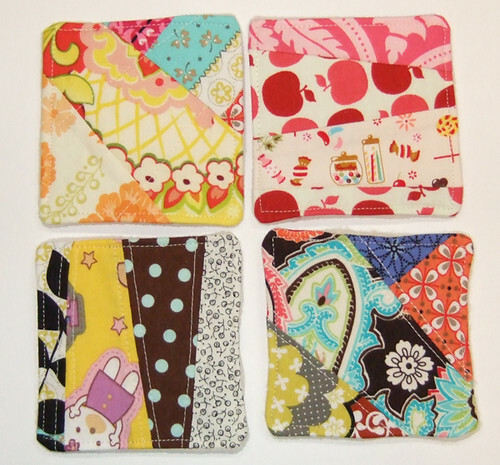 Note that the templates have numbers in the areas, that is the order I recommend you sew/fill the sections. In this case this print is the print I will be using for the middle section. Now find the piece you want to cover section #2, Lay it with the Right sides together with print #1. 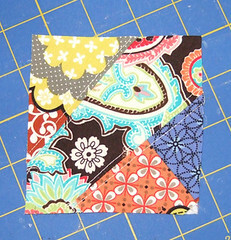 Lay it slightly over the line you will be sewing, so that when it is sewn and flipped right side up, it will cover section #2. 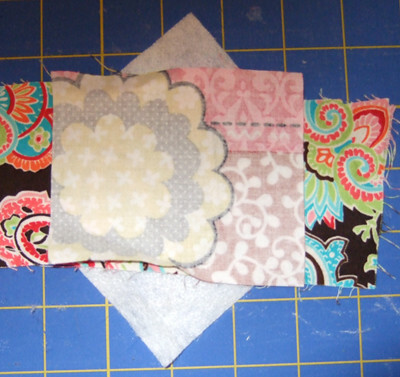 Being careful not to shift the pieces, flip over and sew the line! Iron Pieces out. 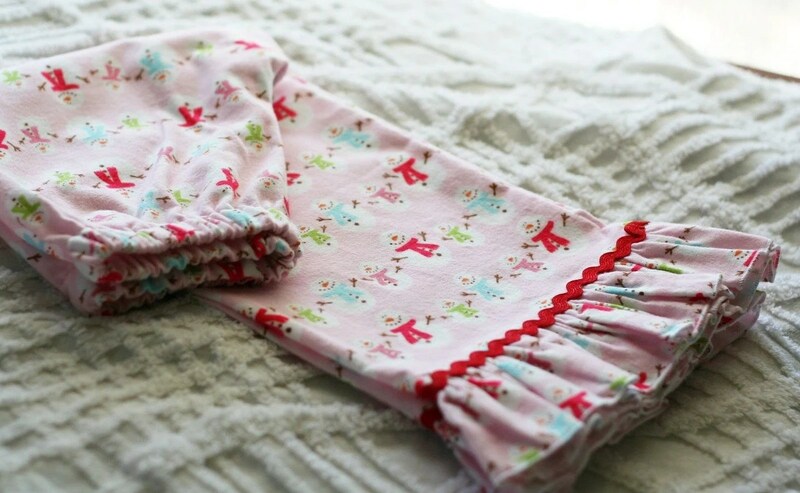 This should now fuse your fleece to your fabric! Then Trim the excess around the square off. 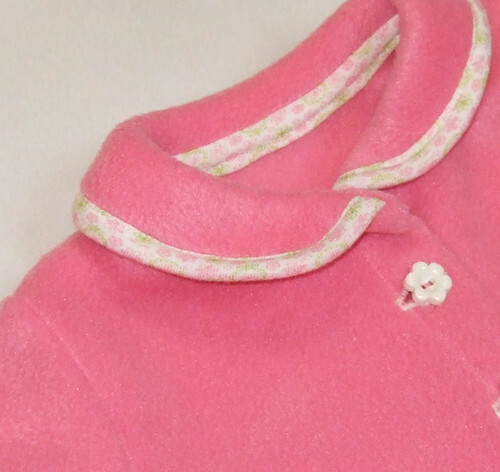 Now topstitch if desired. 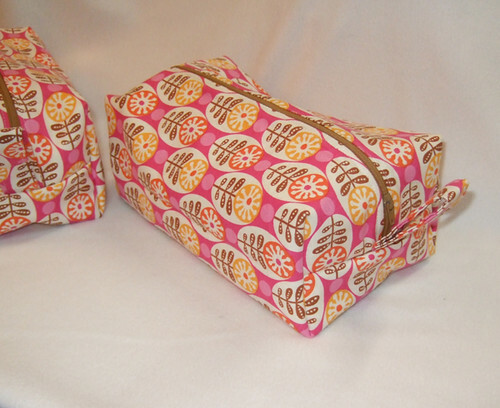 Sometimes I stitch on both sides of the seams. 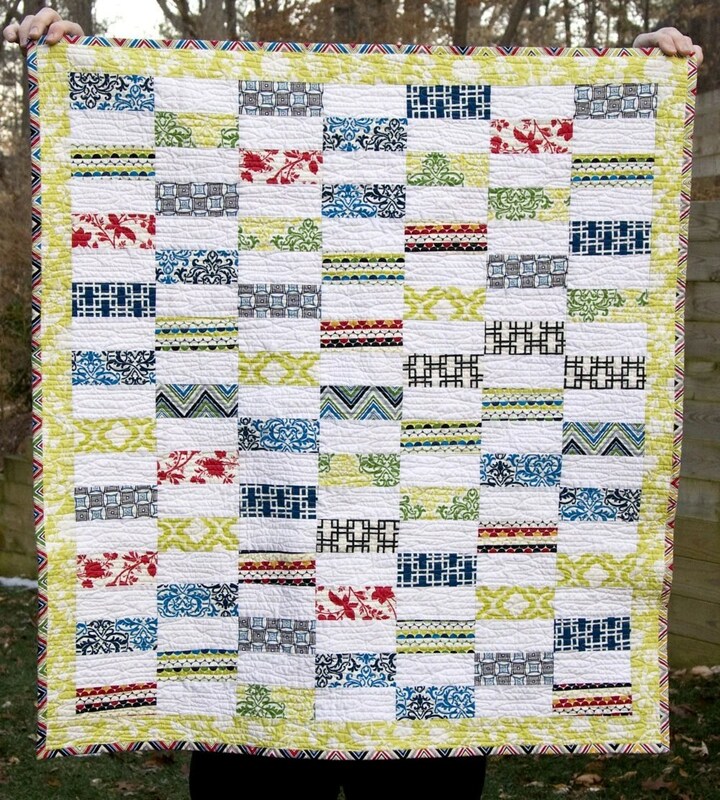 But you can stitch in the seams, just on one side, stipple quilt it, quilt lines the opposite direction of the seams, or not even topstitich it at all! 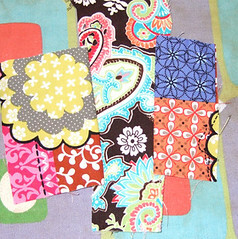 Place your square right sides together with your fleece scrap and trim around. 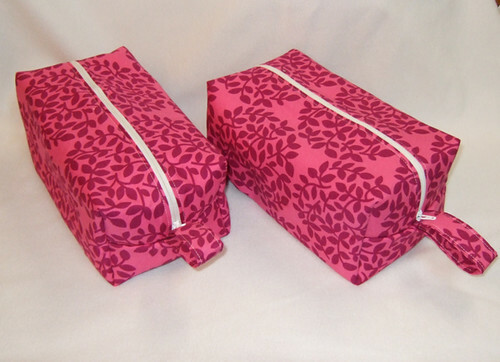 Then sew, using a 1/8″ seam allowance, around starting 1″ from a corner all the way around and 1″ into the same side you started, leaving an 1.5″ opening or so. Trim the corners. Now turn your coaster. 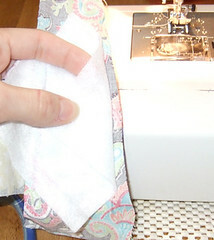 Then fold in the opening raw edges. 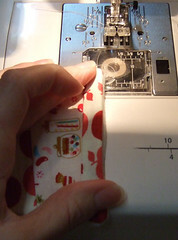 Start on that side and topstitch 1/8″ from the edge all the way around. I showed this mask that I made my Dad for Christmas and was asked by several to put together a tutorial!! 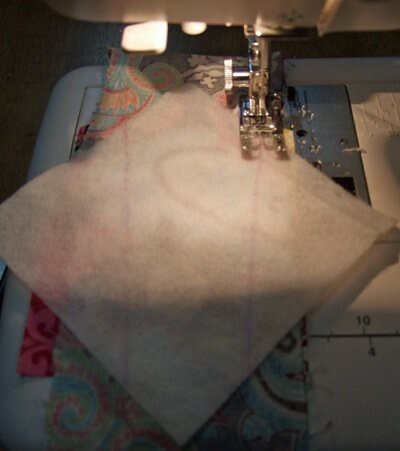 I am one of those “easier the better” and “the less pieces to trace/cut the better” seamstresses. So I wanted to challenge myself in my “time off” from diaper sewing to do something more complicated, with more then 2 pattern pieces, and something I wouldnt skimp on the details. 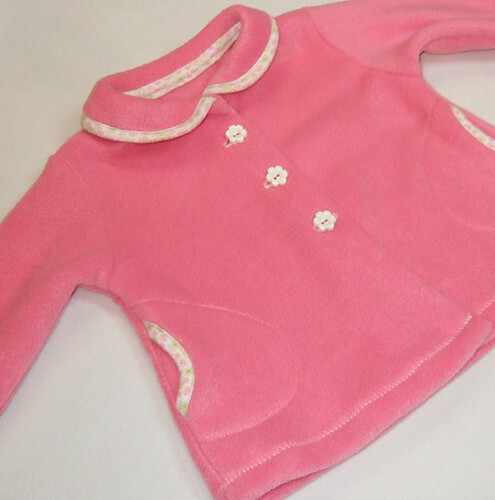 Made with Pink Fleece and trimmed with tiny pink/green floral knit. 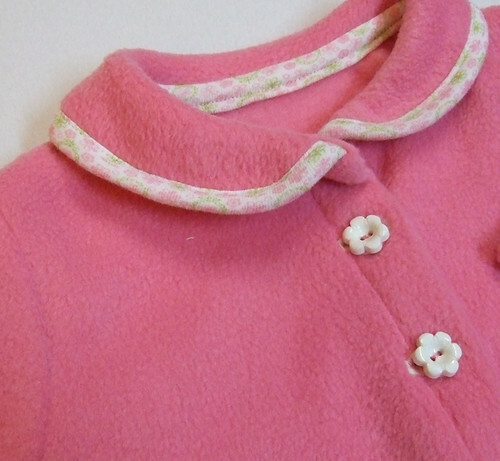 Buttoned up with cute white flower buttons! 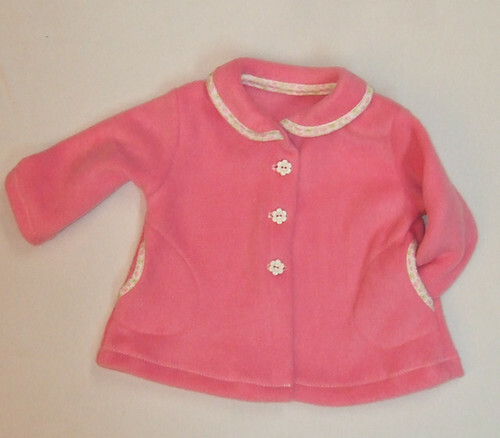 This pattern even has a COLLAR, POCKETS and BINDING which I DID!!!! WOW I have impressed myself, lol. Started Homeschooling back up and this took every bit of our morning. And they each received approx 30 minutes of Computer time. The rest of the time they played Legos, dug in the sandbox *for a short 15 minutes as it was COLD today*, setup a farm in the living room with the new grain bins/building/tractor set. And several other things! We had a blast today! 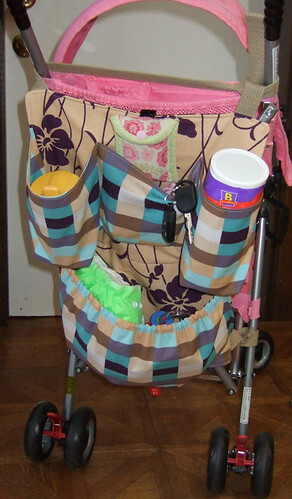 So this idea for an umbrella stroller organizer has been in my sketch book for a long time. Decided to get to workin on the pattern! 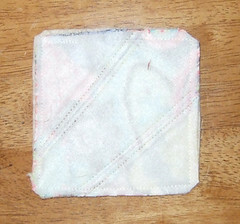 3 divided pockets along the top. 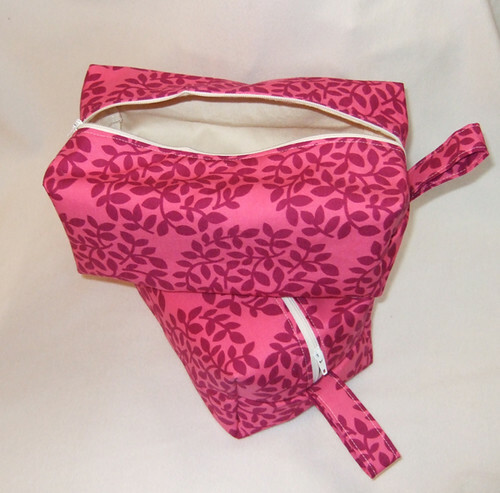 1 large elastic topped pocket on the bottom. 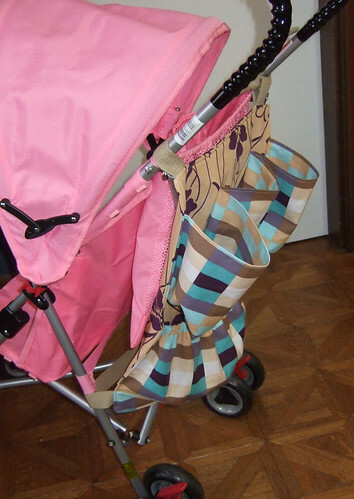 Ties to the stroller with cotton webbing. Loops from one side to the other through a loop then tie as tight as you like. Ties at the top and bottom to avoid hitting your knees on it while walking! There are several things I would change next time. 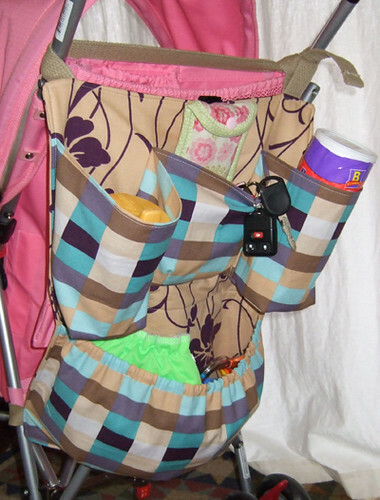 Including the way I did the bottom of the top side pockets.. and I think I would make those pockets a TAD shorter. A smaller sippy or can of soda would get LOST in them, lol. 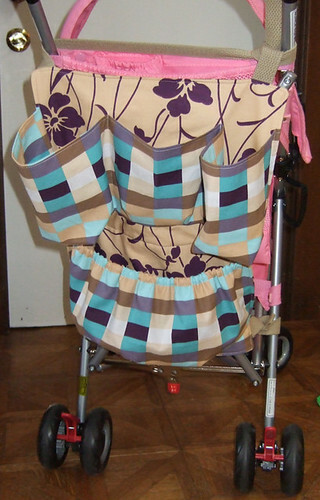 Also had I known I would have liked the first draft so much I would have made it in a fabric I liked better and one that matched our stoller, lol. These were so fun! I can see LOTS and LOTS of these in my future! Lined with Heavy Hemp Canvas for structure. Park Slope prints on the outside! 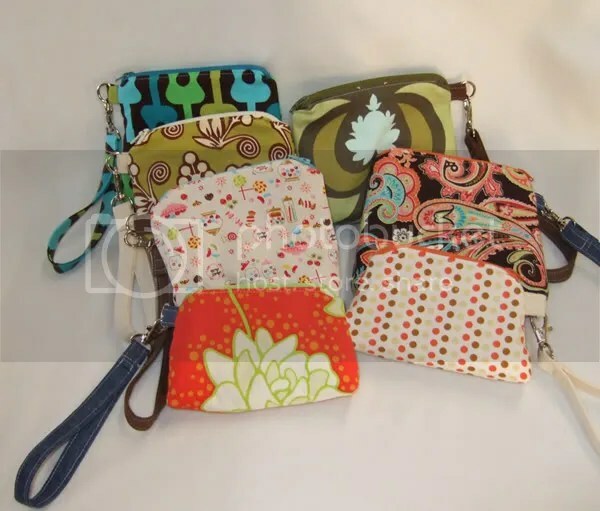 They are listed in my Etsy shop. As well as many other things. But I dont want to turn this blog into just a place to spam my stuff. I love to hear your inspirations, see links of what is on your to-do list, fun things you cant wait to make… 😀 Maybe something you want a tutorial for! 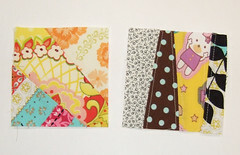 Also, Created an Etsy Treasury!! So fun! i just finished these today! 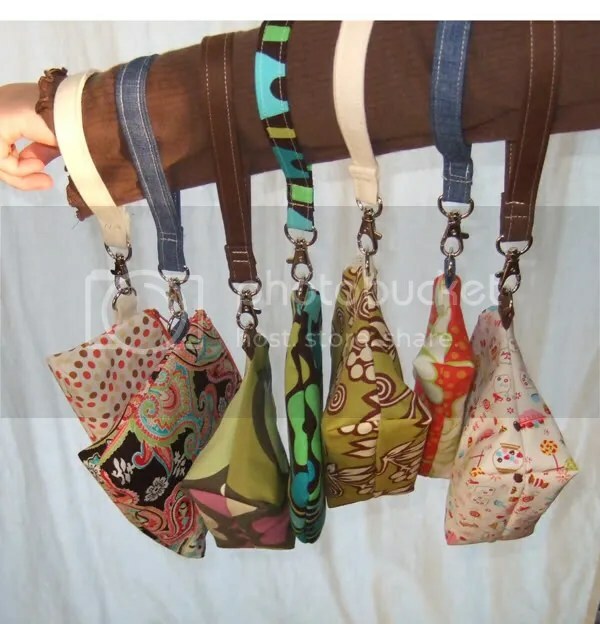 7 total, 5 medium sized and 2 small. Well craft fair season has come to an end for this year. Which always leaves me with stock I will put in my ATB store and SOMETIMES someone stumbles across it and buys something, lol. 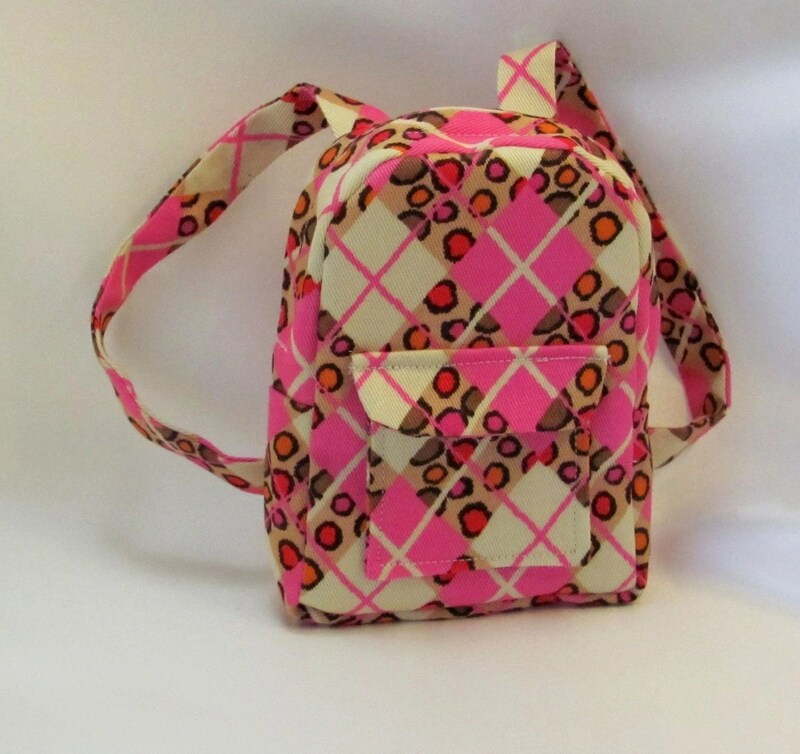 So I decided to try to list it on Etsy instead and see how it fairs. 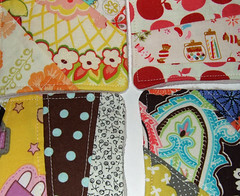 So far doodle bags and chalk mats listed. I have more of each, just havent edited photos and put them up yet!